PDFConvertTools Toolbar is the PUP that uses misleading techniques to prevent removal. Use Reimage to locate malicious components and get rid of them faster than with uninstall instructions. A full system scan blocks virus reappearance and prevents traffic to malicious domains. Shall I install PDFConvertTools Toolbar or not? How is it possible that it managed to get inside the computer without my knowledge? How to remove PDFConvertTools from the PC? PDFConvertTools Toolbar allows converting documents to PDF files. The developers of this tool probably are well-known for many of you – Mindspark Interactive Network, Inc., that are already known as IAC Applications. The company is famous for developing toolbars and software that often receives negative feedback. This time we also received many complaints about this toolbar. Users claim that it appeared on their computers out of the blue. For this reason, they entitled it as “PDFConvertTools virus.” We want to point out that it’s not a virus. Cyber security specialists agree that this application can be called as potentially unwanted program due to its controversial distribution technique. Even though it has an official website, it also spreads with freeware and shareware as an optional component. This feature allows getting inside inattentive users’ computers. However, it is possible to prevent unwanted applications from being installed on the PC. Users just have to get used to installing new programs using secure settings. Though, if you made a mistake and let this toolbar inside, you have two options – to let it stay or uninstall it. We recommend the second option because we do not believe that programs should sneak inside computers without directly asking users’ permission. That’s why we recommend PDFConvertTools removal. You can easily uninstall this app manually; however, we suggest scanning you PC with Reimage or another reputable anti-malware program because some potentially unwanted applications might be hiding in the system as well. Some computer users claim they haven’t installed this program themselves and have no idea how it ended up on their computers. 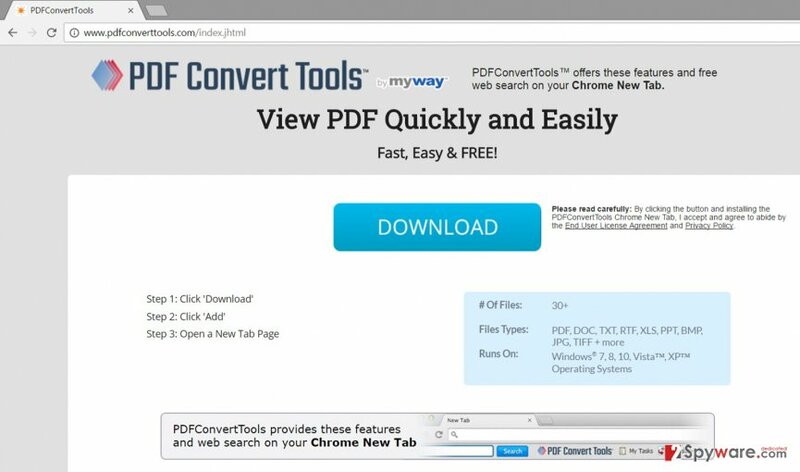 Even though, PDFConvertTools Toolbar has an official website that offers to direct download; it’s not the only way how this tool might get inside your computer. 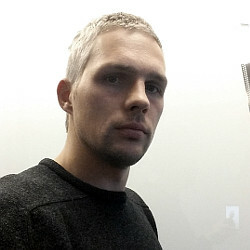 The developers use shady software marketing technique called “bundling.” This method allows adding extra applications to the software packages. Furthermore, when a user installs this software package using Basic/Quick settings, he or she can expect PDFConvertTools hijack. It might happen because this installation setup does not inform about additional applications and install them by default. For this reason, you should not rely on this setup and always opt for Custom/Advanced mode. It reveals all extra apps and allows rejecting their installation. You can remove PDFConvertTools Toolbar from the computer just like any other regular program straight from the Control Panel. However, you should not forget to uninstall browser extension from your browsers as well. If you haven’t installed this toolbar yourself, you should carefully investigate all recently installed programs because there might be other potentially unwanted applications as well. Additionally, you can leave PDFConvertTools removal for the reputable anti-malware program. Automatic elimination method is quick and simple even for inexperienced computer users. This technique requires scanning the computer with your chosen security software. Go to Programs in Control Panel and uninstall PDFConvertTools Toolbar. Then, remove browser extension from all web browsers and reset their settings. Here, look for PDFConvertTools Toolbar or any other recently installed suspicious programs. Wait until you see Applications folder and look for PDFConvertTools Toolbar or any other suspicious programs on it. Now right click on every of such entries and select Move to Trash. Follow the instructions to reset Internet Explorer after PDFConvertTools hijack. When in the new window, check Delete personal settings and select Reset again to complete PDFConvertTools Toolbar removal. These steps will help you to fix your browser. Once these steps are finished, PDFConvertTools Toolbar should be removed from your Microsoft Edge browser. Uninstall PDFConvertTools Toolbar from the Mozilla Firefox and look for other suspicious extensions as well. Then, reset Mozilla Firefox and set your preferred homepage and search engine. Here, select PDFConvertTools Toolbar and other questionable plugins. Click Remove to delete these entries. Now you will see Reset Firefox to its default state message with Reset Firefox button. Click this button for several times and complete PDFConvertTools Toolbar removal. Delete PDFConvertTools from the Google Chrome along with other extensions that might have been installed on your browser as well. Then, reset browser’s settings by following these instructions. Here, select PDFConvertTools Toolbar and other malicious plugins and select trash icon to delete these entries. Click Reset to confirm this action and complete PDFConvertTools Toolbar removal. Here, select Extensions and look for PDFConvertTools Toolbar or other suspicious entries. Click on the Uninstall button to get rid each of them. Here, look at the Homepage field. If it was altered by PDFConvertTools Toolbar, remove unwanted link and enter the one that you want to use for your searches. Remember to include the "http://" before typing in the address of the page. Now you will see a detailed dialog window filled with reset options. All of those options are usually checked, but you can specify which of them you want to reset. Click the Reset button to complete PDFConvertTools Toolbar removal process. ^ PUPs Explained: What is a “Potentially Unwanted Program”?. How-To Geek. For Geeks by Geeks. ^ Freeware vs. Shareware. Diffen. The largest collection of unbiased comparisons in the world. ^ Nadia Kovac. What Are Browser Hijackers?. Norton Community. Norton Protection blog. ^ Nate Lord. What Is Personally Identifiable Information?. Digital Guardian. Data Loss Prevention. This entry was posted on 2017-01-20 at 05:56 and is filed under System tools, Viruses. You can quickly scan the QR code with your mobile device and have PDFConvertTools Toolbar manual removal instructions right in your pocket. How did you remove PDFConvertTools Toolbar?